CANADA “ACTIVELY MARKET[ING] ITS OIL TO ASIAN BUYERS, INCLUDING CHINA” AFTER OBAMA’S KEYSTONE DELAY: “Oil-sands output has grown quickly, and Alberta and Canadian officials have sought out new markets. “That has particularly been the case after the U.S. State Department late last year delayed a decision on a pipeline proposed to carry oil from Alberta to the U.S. Gulf Coast. 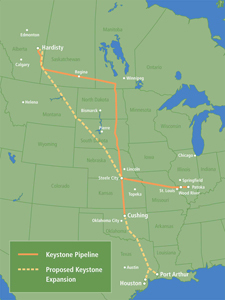 The decision to not make the right decision about the Keystone Oil Pipeline was a political decision by Obama to appease his base--to hell with the economy. The decision to dumb-down the military is another political decision to appease his base--to hell with national security. While I agree that both the Iraq War and the Afghanistan War became unsustainable, in their progression, I do NOT agree that our national security should be compromised by an ideologue politician who is desperately seeking re-election.